We're Brandon and Mel, a husband and wife, wedding-photography duo. Brandon is the lead photographer and owner, and Mel is the second photographer and number-cruncher. We have a newborn son, Wilder, and a three-year-old son, Rowen, and a fur-baby black Lab, Sadie. We enjoy exploring (hiking, running, biking) the thousands of acres of state forest in our backyard, slowly killing all the plants in our annual garden, and enjoying the simpler things in life. We've been photographing for 8-9 years (originally photographing local events) and shooting weddings for 7 years (we didn't jump into weddings until we were comfortable with everything a wedding would be able to throw at us). Technically, we're in Western Massachusetts, but we're at the corner of Massachusetts, New Hampshire, and Vermont, and because of family and proximity, we travel to Maine, New Hampshire, and Vermont regularly. How would you describe your shooting and editing style? Shooting and editing styles are very independent from one another. When we cover a wedding, we shoot in a photojournalistic way, in an attempt to be "Wedding Photography Ninjas (™)", and capture the moments and emotions of your big day without making our presence felt. 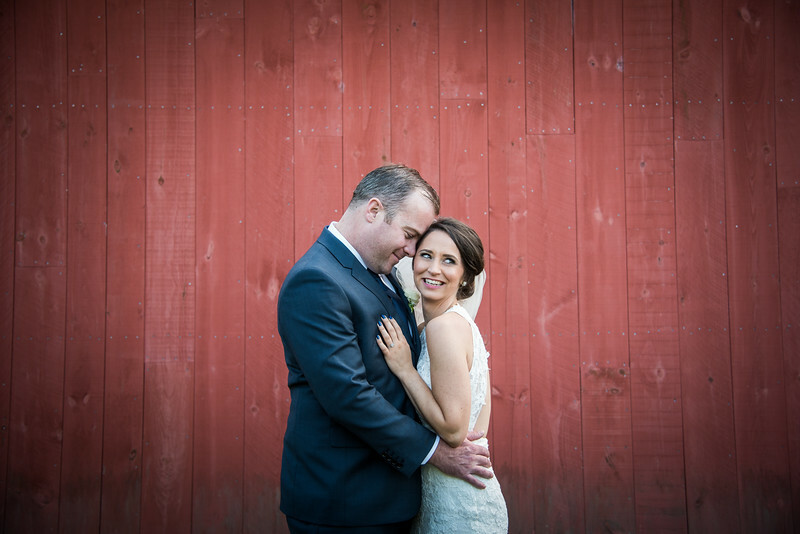 One of our past couples said "Brandon and Mel were both so lovely to work with. They gave great direction when it was required, but also let us do our thing and stayed out of the way, while capturing all the special moments." I would describe our editing style as timeless. I don't overedit, but try to bring out the natural contrast, vibrancy, and color in an image. We try to stay away from editing trends. You know how you can almost instantly tell that a hairstyle, particluar piece of fashion, or song is from the 1980's? We don't want your images to seem dated when you look back on your wedding images. Washed out (vintage-like) images are all the rage now, but we're shying away from this current editing trend. What are your wedding collections like? Our Wedding Collections are centered around the hours of coverage you may need. Most of our clients choose coverage in the 6-10 hour ranges. We design beautiful handmade albums, custom wall art, and a variety of other heirloom products, and encourage our clients to chat with us to let us know how they plan to display and memorialize their wedding images. Reach out to us HERE and we can talk a bit more about your wedding photography hopes and dreams. We start at $2500 for 6 hours of continuous coverage, and the delivery of at least 300 edited, high-resolution files, with personal printing and sharing rights for your wedding images, and a beautiful 11x16 wall art print selected from an image of your wedding day. All of our wedding packages include me, Brandon, as the lead photographer. Mel, my wife, is my second shooter, and is available to couples who are interested in adding an additional viewpoint to their wedding day. I shoot about 2/3 of weddings in a given season by myself. We travel all over New England, from the Greater Portland, Maine area, to Jay VT (on the Canadian border), to Upperstate NY (OK, not technically New England), and everywhere in between. Travel up to 2-3 hours (one way) is included in our Wedding Collections. Any travel beyond that will be assessed on a case-by-case basis. Yes! We schedule our engagement sessions on weekdays, to keep high-demand weekends open for weddings. Our engagement sessions are typically about 60-90 minutes in length, and include 25-30 final images and an 11x16 selected from a delivered image from your session. We're interested in an engagement session, but we're still on the fence. What are the pros/cons to scheduling a session? An engagement session gives you some great time to interact with us, your photographers, before your wedding. If you are a bit uncomfortable with a lens pointed at you, you can ease into the process during an engagement session, and not the morning of your big day. Don't worry, we'll help break the ice by telling cheesy jokes or something. Because a laugh at a lame joke is still a laugh, and we'll be able to get some nice reaction photos. You can also use the photos from your engagement session to make up Save the Dates or a sign in book if you would like. What can we expect for communication from you before our wedding? Initial contact: Whenever you decided to initially contact me. Phone call/in person consultation: I generally try to schedule these within a couple of weeks of you first reaching out. The consultation gives us a good time to learn about your wedding plans, get to know one another a bit, and see if we'd be a good fit for you. Booking:This has no distinct timeline, as it's very much up to you to decide when to book. There may be a few emails back and forth to make sure all of the booking details are accounted for. 3-6 Months before Wedding: At this point I'll send out a questionnaire that will give me a better idea of your wedding day details and when/where things will be happening. 1-2 Weeks before Wedding: A brief phone call (10-15 minutes) to iron out any last minute changes and make sure we're all on the same page! Wedding Day: It's your wedding day! Time to make some beautiful memories. While the above is a common timeline for communication, we encourage our couples to reach out whenever they would like with any questions! My worst fear came true and it's raining on my wedding day. Can we do anything to salvage the photography? First of all, if you're a superstitious person, rain on a wedding day is considered lucky. Secondly, provided you have a rain option, we'll be as creative as we can be indoors. Should we give you a shot list for our wedding day? We recommend giving us an idea of aspects of your wedding that are unique to you or out of the ordinary (e.g. heirloom jewelry that will be worn, a distant family member that you don't have the chance to see often), so we understand their significance before wedding day. You don't need to provide us with a comprehensive shot list ( e.g. "shot of bouquet", "shot of bride with mother"), as we know to capture the details that tell your wedding day story. What happens if something runs late and we need you to stay longer? That's certainly not a problem. I typically stay 10-15 minutes beyond our scheduled coverage anyway to make sure I'm wrapping up during a nice lull in your reception. I don't want you to feel like I'm clocking in and out for a shift. That being said, if requested by the couple to stay beyond my normal time, I will make sure you are OK with the additional coverage, as we do charge in increments of 30 minutes of coverage. We just request that you settle the bill for the additional coverage at your earliest convenience after your wedding before we edit or release those images to you. Do I need to provide you with a meal? That would be very nice of you. Our contract allows for a 30-minute break if a meal isn't provided. We get pretty hungry after travel and shooting for an extended period. Normally we eat at the same time that you eat, because the time that you're chomping down on a salad or filet mignon is a good time for the camera to rest for 10 or 15 minutes. Unless you are looking for chewing pictures in your wedding coverage, of course, and we can certainly work something else out. When can I expect my wedding images? What is your typical post-production timeline? ~2-3 weeks--a preview album (25-40 images) will be posted to our website and we'll provide you with a link letting you know it is live. ~5-7 weeks, full delivery of your images (either via download or mailed to you on a personalized USB). Are your images edited? How would you describe your editing? Everything that we deliver to you is culled (sifted through to removed blink, winks, and the occasional out-of-focus shots), fully edited, and something that we are proud to stand behind and is submission worthy. We look over every individual image, even if an image needs just a slight tweak for color balance, contrast, clarity, or sharpness. We never deliver anything unedited (straight out of camera). May I have black and white versions of an image? You certainly may. Thank you for asking so politely. We make sure to deliver one copy of every image in both black-and-white and color. I used to edit select images in black-and-white, but I decided it may be a little selfish to assume the ones I enjoyed in black-and-white were the same as my clients. So I decided that delivering both color and black-and-white removed any guesswork. Our 4-hour packages are delivery via download (because of a more manageable amount of high resolution files and because they don't include any prints). Our 6, 8, and 10 hour collections are delivered either as a digital-only collection (via a private online gallery with download), or as a package via USPS and include your high-resolution files on a personalized USB and a custom-designed USB case. We promise at least 50 delivered images for every hour that we shoot (60-75 per hour if a second photographer tags along). We do try to deliver quite a bit more than that, but that at least gives you a benchmark. Will you watermark my wedding images? Nope, no-how. We never watermark images that are delivered to clients. If we are sending over images to another vendor to promote themselves, or if we're posting to social media, those images may have watermarks so future clients know where to find us. Yes. Yes. Yes. We insure all of our gear, and we're covered for liability and property damage. Insurance is peace of mind and we want both of us to have one less thing to worry about. What gear do you use? Do you have backups? Though the gear isn't as important as the images being produced, we shoot on full-frame Nikon cameras and pro-grade lenses (from a variety of manufacturers). We backup everything just short of paranoia. Our mantra is "expect the best, prepare for the worst", and we bring redundancies in cameras, lenses, batteries, flashes, and memory cards just in case they're ever needed. Sure thing! To hold your wedding date, we require a non-refundable retainer (25 percent of your total wedding collection), as well as a signed Wedding Photography Contract. We require 25% upon booking, with the remainder due at least 30 days before your event. If you'd like to pay earlier, we probably won't put up a fight. Booking is simple. A signed contract (which includes some legalese, but is mostly what to expect from us, and what we can expect from you, along with important times, locations, dates, etc. ), along with 25 percent of your Wedding Collection price secure your wedding date--and you're officially booked! Can I pay on or after my wedding date? Unfortunately, no. We don't take payment on wedding day mostly because we think it's tacky to try to try to track you down for a check on one of the biggest days of your life. And because we get to work culling, editing, and fine-tuning your wedding coverage almost immediately (sometimes that same night as your wedding), the payment of your total Wedding Collection covers all the work that takes place on your wedding day and beyond.